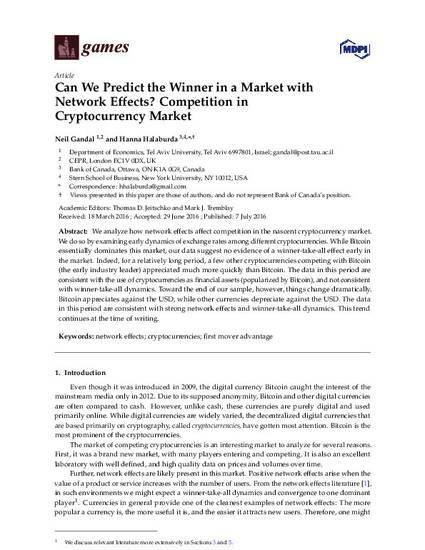 We analyze how network effects affect competition in the nascent cryptocurrency market. We do so by examining early dynamics of exchange rates among different cryptocurrencies. While Bitcoin eventually dominates this market, our data suggest no evidence of a winner-take-all effect early in the market. Indeed, for a relatively long period, a few other cryptocurrencies competing with Bitcoin (the early industry leader) appreciated much more quickly than Bitcoin. The data in this period are consistent with the use of cryptocurrencies as financial assets (popularized by Bitcoin), and not consistent with winner-take-all dynamics. Toward the end of our sample, however, things change dramatically. Bitcoin appreciates against the USD, while other currencies depreciate against the USD. The data in this period are consistent with strong network effects and winner-take-all dynamics. This trend continues as at the time of writing.